At the beginning of the American Revolution, the British offered freedom to any black slaves who joined them to fight the Americans. Of the many slaves who managed to escape and ended up as soldiers, sailors, or workers in the British army, one became the most feared and respected guerrilla commander of the Revolution. Born in 1753, Titus was the slave of a cruel, quick-tempered Quaker named John Corlies of Shrewsbury in eastern Monmouth County, New Jersey. When the Quakers in that region began to free their slaves, Corlies refused to do so and by 1775 was one of the few remaining Quaker slaveholders in the county. 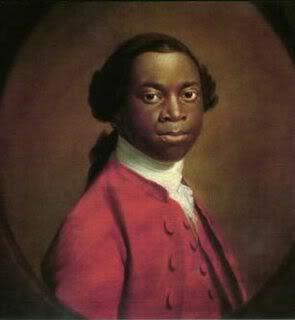 Things changed when on November 7, 1775, after being forced to flee onto a British warship off Norfolk by the patriot militia, Virginia’s royal governor, Lord Dunmore, issued a proclamation offering emancipation to any slaves belonging to rebels who were willing and able to bear arms for the crown. Twenty-two-year-old Titus escaped the following day, joining a flood of blacks from Monmouth County who made their way to Norfolk to enlist in Dunmore’s newly formed Ethiopian Regiment. In spite of warnings by outraged slaveholders that runaway slaves would be executed and that any who joined the British would be sold to sugar cane plantations in the West Indies if caught, within a month about 800 slaves had escaped, many bringing their families with them. 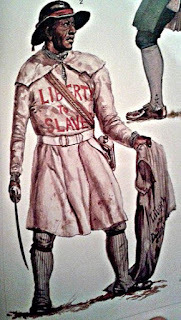 The Ethiopian Regiment served in 1775 and 1776, and with its uniform emblazoned with “Liberty to Slaves” became a symbol of hope for enslaved black Americans. Although the men were most often used for foraging, constructing fortifications, and other work, they also saw battle. They fought effectively alongside the Regulars to defeat patriot militia forces at the Battle of Kemp’s Landing. After Dunmore’s defeat at the Battle of Great Bridge, he loaded his black troops onto ships of the British fleet headed for New York, where he hoped to give them better training. The cramped conditions led to the spread of smallpox, however, and with only 300 of the original 800 soldiers surviving, Dunmore disbanded the regiment in 1776. Nothing further is known of Tye until the Battle of Monmouth in June 1778, the first military action he’s known to have fought in and during which he captured an American militia captain. As the leader of the Black Brigade, an elite guerilla unit of 24 men that served in New Jersey alongside the Loyalist Queen’s Rangers, he became known as Colonel Tye, an informal rank given out of respect since the British Army didn’t formally commission black officers in the 18th and 19th centuries. He and his band raided and plundered Shrewsbury the next month, capturing two of the town’s inhabitants. 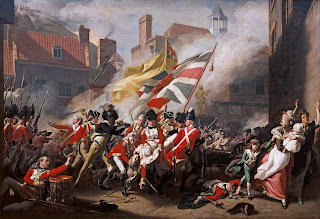 During the severe winter of 1779 they and the Queen’s Rangers provided protection for the British in their stronghold at New York City and launched raids to obtain food and fuel for the garrison. By 1780 the Black Brigade had become a significant military force and the most feared Loyalists in New Jersey with a reputation as fierce and canny fighters. Tye’s familiarity with the area’s swamps, rivers, and inlets enabled his Black Brigade to strike swiftly and unexpectedly, and then disappear before the Americans could respond. In one week in June he led three raids in Monmouth County. On June 9, he and his men killed Joseph Murray, hated by Loyalists for executing captured Tories under a local vigilante law. On June 12, while Washington’s hard-pressed army fought the Regulars, he and his band made a daring raid on the home of militia leader Barnes Smock, captured him and twelve of his men without taking casualties, plundered their homes, destroyed their cannon, then took their captives to New York without being detected, thus depriving Washington of badly needed reinforcements and terrorizing local patriots. The British paid Tye and his men well for their efforts, sometimes as much as five gold guineas, and as a result of their exploits the number of slaves escaping to the British kept growing. That September Tye and his Black Brigade attacked the home of Captain Josiah Huddy, an officer who had been wanted by the Loyalists for several years. Huddy and a friend, Lucretia Emmons, managed to hold off their attackers for two hours, until the Loyalists torched the house. Tye was shot in the wrist during the battle, a minor wound that became infected, and he died from gangrene within weeks. With Colonel Stephen Blucke of the Black Pioneers in command, Tye’s raiders continued fighting long after the British defeat at Yorktown. And Tye left behind a reputation that lived on among his comrades as well as among the patriots who fought against him. J. M. Hochstetler is the daughter of Mennonite farmers and a lifelong student of history. She is also an author, editor, and publisher. Her American Patriot Series is the only comprehensive historical fiction series on the American Revolution. Book 6, Refiner’s Fire, releases in April 2019. Northkill, Book 1 of the Northkill Amish Series coauthored with Bob Hostetler, won Foreword Magazine’s 2014 Indie Book of the Year Bronze Award for historical fiction. Book 2, The Return, received the 2017 Interviews and Reviews Silver Award for Historical Fiction and was named one of Shelf Unbound’s 2018 Notable Indie Books. One Holy Night, a contemporary retelling of the Christmas story, was the Christian Small Publishers 2009 Book of the Year and a finalist in the Carol Award. Wow! Thanks for telling this man's story. Connie, you're so welcome! I just love it when I find the stories of people whose contributions during critical times have essentially been buried, which especially includes women and minorities. It's what keeps me passionate about delving into history. I know you are working hard on RF! Just wanted to give you a hard time. It amazes me at how much you are always able to find about the Revolutionary War. Fascinating stories you bring to life so well. Thanks for the interesting post. Martha Rogers Joan does a lot of research to find all these things about the Revolution. I enjoy reading all the tidbits she finds. Some I know from reading and some she posts are new to me. Thanks, Martha! Like Bev says, it's research, research, research. Lol! There's so much fascinating stuff hidden in the pages of history, and I just love it when I dig out something I never discovered before.